The idea for WNY Gamers Club was formed back in 1998-1999 at one of the numerous monthly LAN parties held simultaneously, in a small apartment in Clarence, NY and a garage in Hamburg, NY. The name was not around during those first years and little did we know but the core foundation was being built. A group of 12 to 18 attended these LAN parties on a regular basis mainly to play the original Unreal Tournament, the days when everyone had their own skins, voice packs and stood out. In 2001 during one of the Clarence apartment LAN parties, everyone was noticing that it was a packed house, at that time around 16 people, the suggestion came up to start a website to let people know when and where the next LAN party would be. So wnygamersclub.com was registered and came to be. At first it was a simple site with information and pictures from previous frag-fests, and then in 2003 the site expanded with the addition of forums and a face lift in 2004 to the main site. 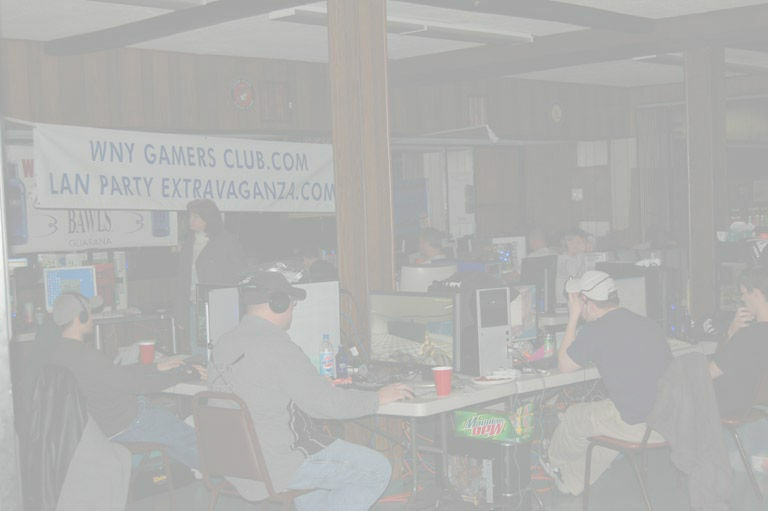 WNY Gamers Club has since grown with the addition of our larger LAN Party Extravaganza (LPE) events, which started in March of 2005 and drawing an attendance of over 60 gamers (PC and Console) at a time. These run along side of the smaller house LAN’s which have now moved from the old apartment and garage locations to a house in Tonawanda, NY. We try to hold all LAN parties on the 2nd Saturday of each month, with weather being unpredictable in WNY this sometimes becomes the biggest factor. To see when and where the next LAN party is at, please check either the forums, or our Facebook page.